Complete line of High Quality Industrial Lubricants, Greases and Solvents, ranging from Standard to Specialty Applications. 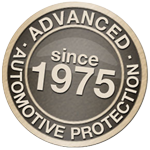 The Industry standard for Automotive Rust Prevention. Specializing in a broad product line of Rust Inhibitors, Coatings and spray Equipment. Keep that new car look with Environmental Paint, Interior and Rust Protection. Extensive line of Protection and Insurance products Exclusive to new and used Automotive Dealerships.